Rise of the Witches is a fantasy t-shirt by Lisa Parker for The Mountain®. 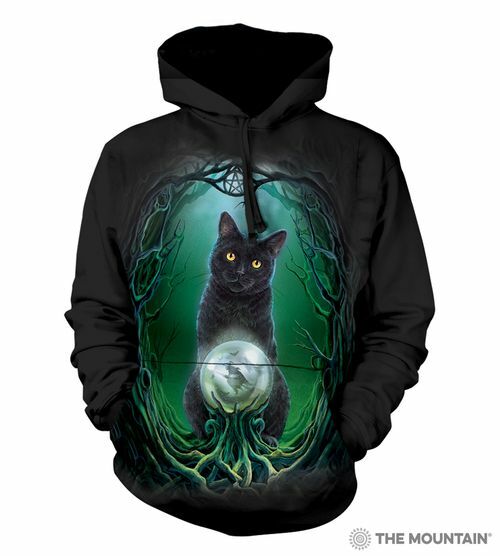 The adult t-shirt features a black cat sitting behind a crystal ball watching her witch flying through the midnight sky. A thicket of growing branches with a pentagram at the top create the frame of this tee. Black cats have historically been considered a bad omen, or the familiar of witches in some cultures. However; we think all of Lisa Parker's black cats are simply enchanting. This black cat t-shirt is a classic fit with a design that is suitable for men and women.